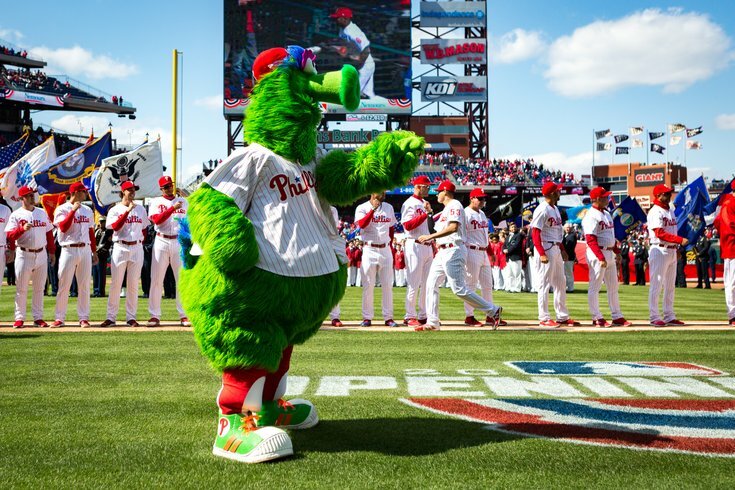 The Phillie Phanatic looks on as the players are introduced prior to the home opener. Wouldn't it be nice to, you know, know what the Phillies roster will look like for the 2019 season with pitchers and catchers reporting in just over two weeks? The ongoing saga slog as Bryce Harper and Manny Machado — and around 100 other free agents — remain unsigned kind of makes it hard to project, or even really think about what things will look like when the highly anticipated new baseball season begins. Live free agency updates: Is today the day Bryce Harper (finally) signs with the Phillies? Even the Phillies themselves are getting annoyed. "I have opinions about this," Phillies' manager Gabe Kapler said when asked about the continuing uncertainty, "but mostly the job of a manager is to focus on preparing his team and taking the pieces he has in place and making them shine on the field." If Kapler can do it, so can we. And so below, we've projected the Phillies 25-man roster for the upcoming season. All the players listed are our best guesses given the information we have about the possible makeup of the team. We'll keep updating this when an update is required. The Phillies only have two backstops currently on their 25-man roster and Alfaro, 25, is the man at catcher in Philadelphia. Alfaro was red-hot to finish the year even as the Phillies' crumbled in the standings, hitting .342 over the team's last 15 games. He is learning to handle a pitching staff better and better and obviously has some offensive muscle (he has 15 career homers and a .270 average over parts of two seasons). The other, Andrew Knapp, is more of a defensive battery mate and will be Alfaro's back up. Hoskins' natural position is first base. With Carlos Santana at first last year Hoskins played a lot of right field, but according to manager Gabe Kapler, the slugger could raise his offensive game even more being back at the first base bag. Franco, like Hernandez, could be on the move or relegated to a support role should a big-time signing occur. Until then, the 26-year-old will be relied on to provide a little pop from the middle of the lineup. He's hit 20 or more homers in each of the last three seasons. Whether it's some kind of left field by committee or one of the aforementioned outfielders emerges while the other is his back up, one can view left as a weak spot for the Phillies. Their options here are inexperienced. Quinn has speed — he stole 10 bases in 50 games. And Williams has power — he had 17 home runs and 50 RBI last year. As with the Phils' infield, this spot would belong to Harper if he inked with the Phils. Knapp and one of the two left fielders mentioned above will be on the bench, and if Altherr and Cozens each make the 25-man roster the Phils will have six outfielders. Keep an eye on training camp to see if an infielder plays his way onto the club, or if the team decides to leave an outfielder out. Rumors continue to swirl about the Phillies possible interest in, well everyone. This includes pitchers — like Corey Kulber, Dallas Keuchel and others. If Philadelphia does not add a starter, the rotation will likely remain unchanged from a year ago.